Guard shacks, security booths, guardhouses ticket booths, gatehouses… These are all names for the same type of pre-assembled buildings. This type of building is convenient, less costly than permanent structures, and they provide the much-needed extra space companies need both indoors and out. One of the biggest benefits of using pre-assembled guard shacks is the fact that they are very versatile. They can be used in a number of industries for a number of reasons. Get a Guard Shack Quote Today! Many companies require strict security measures both inside and outside their buildings. Prefabricated guard shacks are the perfect enclosures for creating office space for employees in charge of keeping the premises secure, as well as providing them protection from the elements outdoors. Guard shack enclosures also make separate and secure offices indoors as well. They can be placed almost anywhere, and with 360-degree windows, they provide a guard or supervisor a panoramic view of the facility. Guard shacks are also used by the military. They are built to withstand extreme temperatures as well as to provide protection against attack. Many of these portable buildings have ballistics protection built in but are still portable so they can be moved quickly. 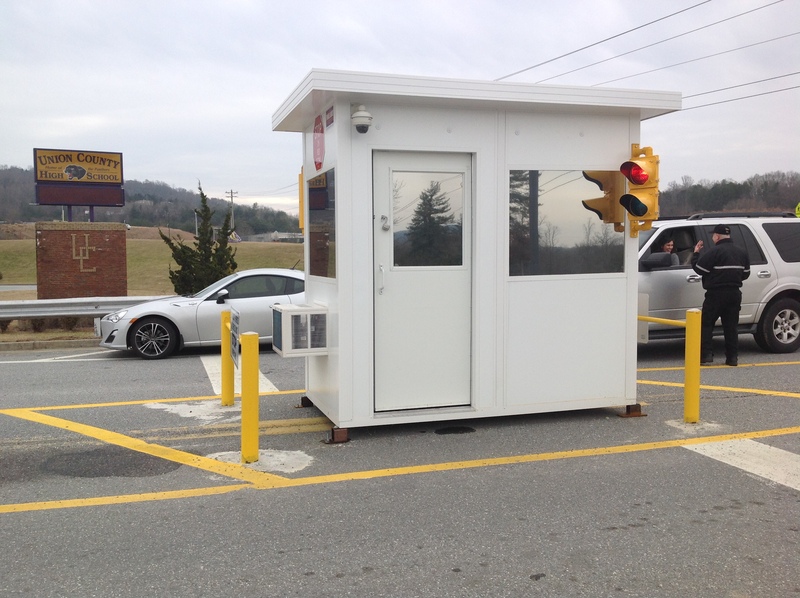 When keeping track of attendance is an issue, a prefab guard shack makes a great ticket booth or gatehouse. In either instance, this portable building allows the gatekeeper to keep track of all the people and vehicles coming into and going out of the premises without having to battle the weather. Electrical and lighting can be added to these buildings to provide the necessary functionality needed to perform these tasks. While it’s obvious that these pre-assembled buildings can be used as outdoor separate enclosures, it’s important to note that they can also be used indoors as well. When placed strategically in the building, they provide mobile office space where none existed before. Since these buildings can be customized to meet the needs of the user, things like electrical, lighting and windows can be added to provide all the comforts of a permanent office. Choosing a modular guard shack over a traditional structure affords its owner several benefits. First and foremost, this type of structure is portable. This means it can be moved at any time for any reason. If you move from one location to another, you can take your portable guard booth with you. Because the portable guard shacks are built to move, they are actually more structurally sound once in place than most buildings. And because it’s made to travel, these buildings are held to a stricter building code. This means they are a more stable and structurally-sound work environment. Another large benefit to choosing pre-assembled guard shacks for your business is that they create less environmental disturbance. This is true in a couple of different ways. First, putting up a prefabricated guard shack at your work site causes less disturbance for your workers and for the surrounding area. They are mostly constructed off-site in our facility and arrive at your location pre-assembled. Neighbors don’t have to put up with excess noise, dirt or traffic due to construction workers and machinery. Secondly, because a portable guard shack is built to be reused, with as little waste as possible, it leaves a smaller carbon footprint on the environment. Panel Built Inc. is a leading supplier of the best available prefabricated guard booth for sale. Our guard shacks are designed for a variety of uses including military and commercial. All of our pre-assembled guard shacks are custom-engineered to meet the needs of our customers while also meeting the building codes in their area. Panel Built carries a vast array of sizes and finishes. Ranging from maintenance-free aluminum to heavy-duty armored steel, we’re sure you’ll find a portable building capable of providing the comfort and protection you need, even in the most extreme environmental circumstances. All Panel Built guard shacks arrive at your location fully assembled and ready to use. They come factory wired as well. Depending on how you plan to use your booth, it can be attached to a concrete platform or hoisted into a tower. 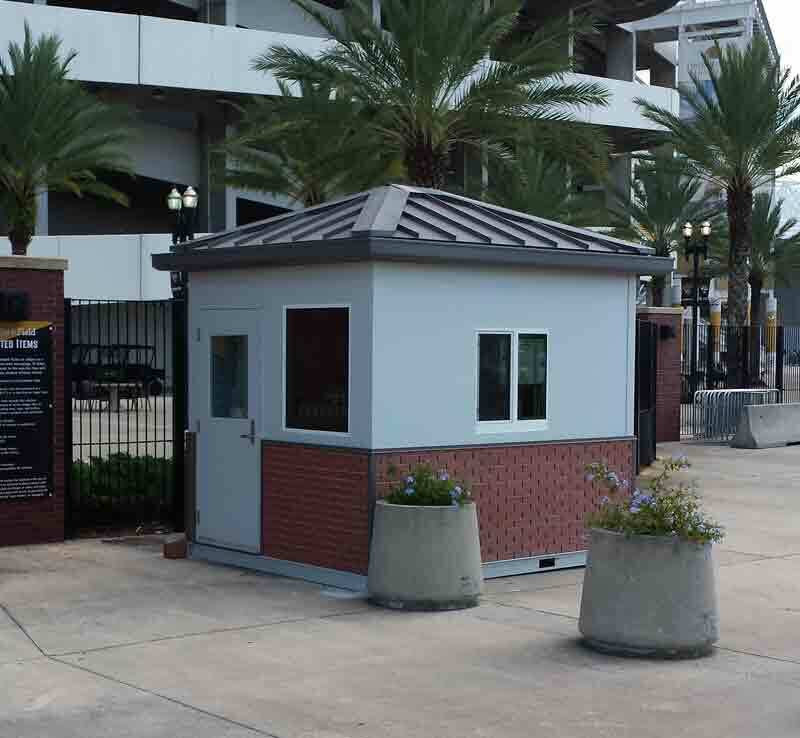 Whether you need a guard shack, ticket booth, gatehouse, or some other type of managed space, Panel Built Inc. can help. Our pre-assembled buildings are ideal for indoor and outdoor use. They can be lifted by forklift or by crane and can be moved at a moment’s notice with no disassembly required. We make it easy for you to customize and order your portable guard booth. We assure you there will be no assembly required once it reaches your location – it will be ready for immediate use. Whether it’s equipment storage, consultant space, attendant booth or mobile office you need, you can be sure Panel Built’s pre-assembled buildings can handle the task with ease. Contact us today to begin discussing your guard shack needs. We look forward to helping you achieve your goals. If you have any questions about our security shacks or prefab buildings as a whole, send us an email at info@Panelbuilt.com or call us at 800.636.3873. We provide all guard shack quotes free, within 24-48 hours of request.